Kevin Gray, our Payroll and Accounts Manager, celebrated 20 years of employment with the company in December 2017. Kevin joined QS Recruitment in 1997, at the age of 18, a Trainee Recruitment Consultant. Within six months of starting his employment, a vacancy arose for someone to take control of the back-office functions for the business (payroll, sales ledger and accounting). Having shown an aptitude for this section of the business, Kevin was appointed to the role. As the business grew and opened more offices in the years following his appointment, so did his role. Initially working on his own to prepare the payroll and manage the sales ledger processes, additional staff were recruited to the department and, in 2013, Kevin was promoted to the role of Payroll and Accounts Manager. In December 2015, Kevin was part of the Senior Management Team which completed a management buyout of QS Recruitment, making him a shareholder in the business. Since then, he has continued to lead the Payroll and Accounts Department (which is now a team of four) and has taken on many new responsibilities. The business invests heavily in providing training for all its staff so that they have the tools they need to be a success. Kevin is no exception and in 2017, he successfully completed the first year of his AAT (Association of Accounting Technicians) qualification. The training will ensure Kevin is prepared to handle the extra responsibilities of managing a growing business. He said: “As I look back on my 20 years with QS Recruitment, I am proud to have been a part of a company which has grown from one office to five, steadily increasing its turnover year after year. I am immensely grateful too, as QS Recruitment took a chance with me 20 years ago and has given me a life I could not have envisaged for myself at that time. “I continue to look to the future and looking forward to being a part of QS Recruitment’s continued growth program, with two new offices due to open in 2018. Likewise, I am keen to develop and train the next generation of QS Recruitment staff over the next 20 years”. To show our gratitude for his years of service, we invited Kevin to choose a gift so that he could mark the occasion and have a reminder of the day. 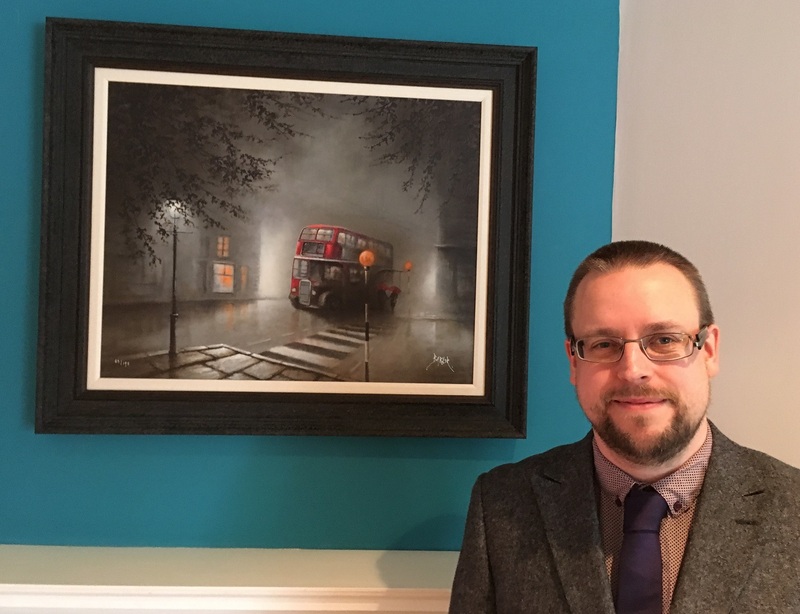 He chose a work of art from Castle Galleries, by Bob Barker, entitled “Is this love”.